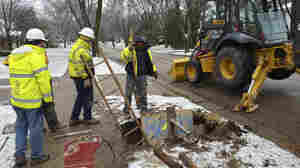 April 14, 2016  The city's 10-year plan to replace 900 miles of old pipes has been met with praise and criticism — and a lawsuit from residents who say the pipe work has raised lead levels in their drinking water. April 4, 2016  Finding a place to live can be difficult for people with arrest records. Beginning Monday it may be easier for convicted felons to rent a home under the protection of the Fair Housing Act. 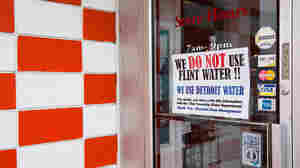 March 31, 2016  The water crisis in Flint, Mich., raised an alarm about the dangers of lead in our water supply, but it is not new knowledge. 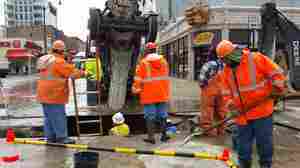 Madison, Wis., knew about it and removed all its lead pipes 15 years ago. March 17, 2016  Three finalists have made the cut to be considered as the next top cop in Chicago. The city is battling a high murder rate, distrust of its police and dissatisfaction with the way the mayor handles police shootings, particularly of black men. March 8, 2016  The tap draws from Lake Huron. Eatery owners have bought ice, bottles and expensive filters. Large signs in windows post lead-free test results. But diners in this Michigan city are still leery. February 24, 2016  Republican Gov. Bruce Rauner challenged Democratic state lawmakers last week to either agree on parts of his so-called turnaround agenda or give him the ability to slash spending deeply in his budget address. But it appears to not have moved anyone off their hard line positions. Illinois is now approaching eight months without a budget. State colleges say they can't budget plan, and some students say they can't afford to continue classes. Lawmakers passed funding grants for low-income students, but Rauner vetoed the bill. February 4, 2016  It's been more than a year since the shooting of Michael Brown sparked nationwide protests. 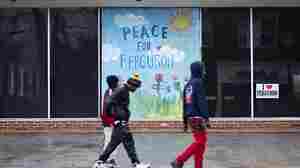 Tension has dissipated in Ferguson, but some disagreements exist among residents about the best way forward. January 27, 2016  Illinois Gov. Bruce Rauner will deliver his state of the state address Wednesday. It comes amidst a budget impasse, partisan fighting and finger pointing over cuts to social services and an underfunded pension fund. January 27, 2016  The stalemate between the Republican governor and the Democratic legislature has left Illinois without a budget. In that atmosphere, Gov. Bruce Rauner is to present his State of the State address. January 20, 2016  Members of the Black Lives Matter movement protested Wednesday at the U.S. Conference of Mayors right before a group of city leaders were set to discuss policing and safe communities. December 28, 2015  Today, Chicago Mayor Rahm Emanuel announced police department reforms in the aftermath of the deaths of two people shot by police just a few hours after Christmas. December 28, 2015  About 100 people gathered Sunday outside the home where police shot and killed two people early Saturday. The Cook County medical examiner's office has listed the manner of both deaths as homicides. December 26, 2015  It's been a year of protests with demonstrators taking to the streets across the nation. Fatal shootings involving police have forced investigations, the ouster of a police superintendent and others. 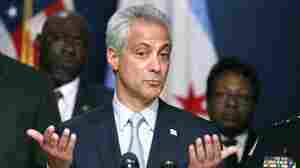 December 9, 2015  In a speech to the full Chicago City Council, Mayor Rahm Emanuel said he takes full responsibility for the fatal shooting of 17-year-old Laquan McDonald last April because it happened on his watch.